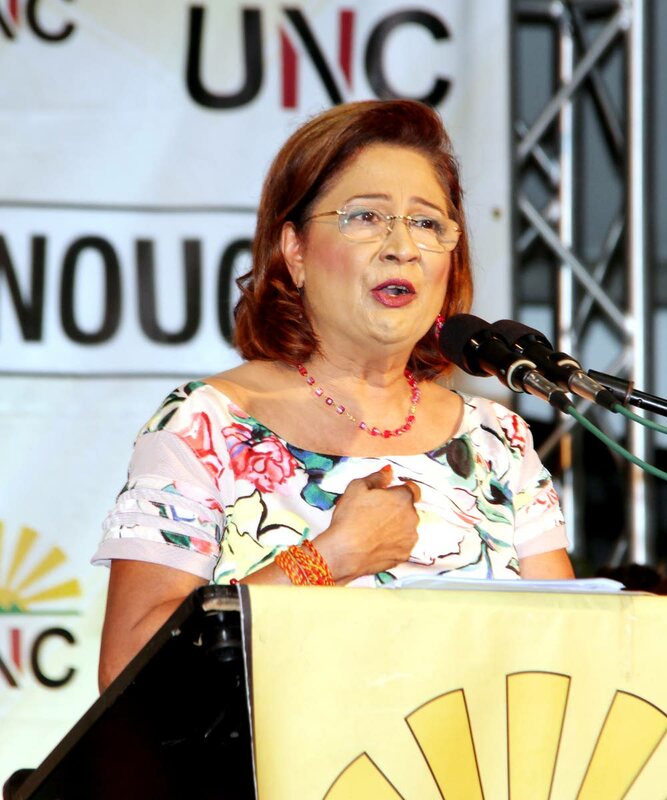 OPPOSITION leader Kamla Persad-Bissessar will file a motion of no-confidence against Works and Transport Minister Rohan Sinanan when the House of Representatives sit in Parliament on Friday. This comes in the wake of the collapse of the inter-island sea bridge for the past several months. The TT Express is now on drydock and the TT Spirit, which was only brought back into service just over a week ago, has been experiencing several problems despite an overhaul on the boat. She said the breakdown in inter-island transportation could be equated to assault on Tobago and was calling for justice. Speaking during the UNC’s Monday Night Forum at Bamboo No 2 Government Primary School, Persad-Bissessar said the PNM admitted they were at fault for the collapse of the seabridge. “I call on the Keith Rowley Government, we boy from Tobago, to make sure to compensate the people of Tobago for the damage done to them. If you can compensate a lady when somebody sexually assaulted her, then they should compensate Tobago for the assault on the people of Trinidad and Tobago,” she said. Persad-Bissessar said there was constant instability of the inter-island seabridge where in one instance, passengers had to be rescued by the Cabo Star when a ferry boat caught on fire en route from Tobago. Persad-Bissessar said Sinanan presided over the total collapse of the sea and air bridge. “This is three in a row. Moses must go. We have seen blunder after blunder. It is a Spirit lash,” she claimed. Responding to Persad-Bissessar’s call for revocation of his position, Sinanan said he is not concerned. “I look forward to it. When I came into office, I met a seabridge that was collapsing. I indicated to the Prime Minister what were the challenges. I indicated that it was something that would take some time to repair, it was not something that would happen immediately. “We identified there was something. We identified that there was a problem with the contract with the cargo vessel and it took us about three months to solve. That problem was solved to a great extent within the first three months,” Sinanan said. The minister denied that there was an issue with cargo space saying the Cabo Star was taking full capacity. Reply to "No confidence in Minister Sinanan"